Have you ever leaned back in your chair at a laser light show, the music swelling as the Crab Nebula forms above you and thought, “man, if only I could play a video game on this thing?” Well, Amplitude Studios has a game for you. Endless Space combines the aesthetic of a planetarium with the addictive gameplay of controlling the galaxy, one click at a time. An appreciation for astronomy aside, what really matters for enjoying Endless Space is a passion for turn-based games like Civilization, Alpha Centauri or Age of Wonders, 4X titles based on the principles of “explore, expand, exploit, and exterminate.” While any gamer will drop their jaw at Endless Space’s nebula-gazing aesthetic, it takes the right kind of player to sift through the game’s winding tech trees and occasionally numbing pace. In strategy titles where sessions last hundreds of turns, campaign modes are often formalities. 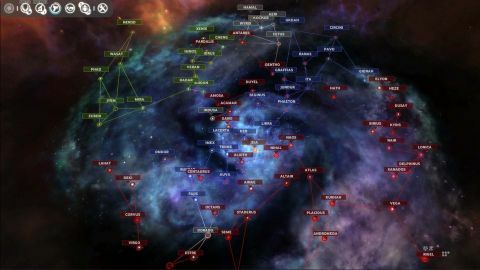 Endless Space agrees, and eschews story mode in favor of customizable skirmishes and online multiplayer. Game settings can be tweaked to an obsessive degree, and you can even customize your own race and save it for later use. This approach certainly makes good on the endlessness the promised by the title, but the eight disparate races and their intriguing descriptions had us wishing we could learn more about them. One problem with Endless Space is that most of its variety, and personality, is found on stat sheets. Until you become intimately familiar with the nuances of the different Space races, you could honestly forget who you’re controlling. The United Empire, a race of capitalistic Terrans, and the Amoeba, a race of giant, surprisingly diplomatic unicellular organisms, both look the same when traveling amongst the stars. They may have different victory conditions, but the closest you’ll ever get to one of their colonies is hovering above the ionosphere. It made us feel rather cut off from our people. Perhaps this is the way a calculating space ruler should feel, but it makes for a somewhat dry, “just-click-next-turn” experience. Space battles are essentially a complex version of rock-paper-scissors, but bring you close enough to the action to watch in eager anticipation as fleets deploy chaff and broadside each other with sprays of ballistics, then move in close to exchange explosive charges. It smacks of Battlestar Galactica mixed with a WWII naval battle, and while it’s fun to watch at first, soon we were content to let them play out on autopilot without spectating. Description Lead one of eight races, or one of your own design, to galactic supremacy, one click at a time.